When you have needs for Chiropractic care, you need to turn to a Chiropractor who listens and responds. 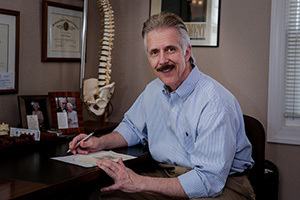 An experienced doctor of Chiropractic who knows the field and can effectively diagnose and treat your needs. A friendly Chiropractor who counsels you on the best ways to maintain and Improve your health. A Chiropractor who is honest, straightforward, and has no problem referring to a medical specialist if he feels your condition warrants it. Dr. Bruno meets all these criteria. Since 1990, Bethesda Spinal Health and Wellness has been working with patients to provide the best Chiropractic care in the Bethesda area. Dr. Bruno's experience in Chiropractic is coupled with genuine concern for his patients. Your comfort and prompt attention are important to us. We strive to make our office as efficient and convenient as possible. Included in these web pages is information about our office, including directions, hours, insurance policies, and appointment scheduling. You can e-mail a request for an appointment with Dr. Bruno by clicking here. We hope you find this website useful and invite you to contact us with questions at any time. You may even request an appointment for a complementary telephone consult with Dr. Bruno if that would prove helpful in your decision making regarding your condition. At Bethesda Spinal Health and Wellness our main priority is to help you reach your maximum health potential in order to improve your overall quality of life. We want this process to be stress-free, so the decision as to what level of care you would like is totally your choice. There is no hard sell to be concerned about. Following the consultation, examination, and X-Rays (if necessary), the findings will be explained and recommendations offered. If you are only concerned with getting relief from pain, then that will be our focus. If corrective care is more of a priority to you, we'll incorporate a more extensive treatment program into our game plan. Should you desire treatment along with wellness counseling involving recommendations on nutrition, exercise, and weight loss, we can pursue that as well. My job is to make recommendations based upon years of experience. Your job is to decide on what course of action best fits your goals. The last thing you need is to have this become a stressful experience since that would only serve to impair the healing process. I even offer a complementary telephone consult, by appointment, in the event that you're unsure as to whether or not Chiropractic care can help your condition. Our office is about utilizing advanced, research-based Chiropractic techniques in a comfortable, relaxed, stress-free environment.